In the preceding pages, we saw not only the manner in which our Planet Earth was created but also, the creation of its future inhabitants. In His elucidation of that particular phase of creation, Chohan Lanto, drawing from the immense reservoir of His Cosmic knowledge, gave us an understanding as to how our Solar Logoi, Helios and Vesta, through successful Cosmic Initiations, were vested with the Power to create the Solar System, part of which is our own Planet Earth. In the following, Goddess Vesta, Divine Complement of Helios - both our Solar Logoi - explains to us how She and Helios qualified to be candidates for the Initiation and, also what position They held in the cosmos before then. Expanding Her talk, She gives us first-hand, authentic information as to how great Universes are created, something hitherto unknown and a mystery to man. Her discourse assumes added significance at present, due to the Cosmic mandate that the time has come for our Galaxy, with its Seven Solar Systems, to advance to Higher Levels in the Cosmos, taking with Them those Planets that have qualified for the advancement and leaving behind any that has failed. This address was given to the students of "The Bridge to Freedom" in 1956 and the excerpt we quote here is taken from "God's Divine Plan for Our Solar System" - an out of print "Bridge" publication. ". . . Helios and I belonged to a Galaxy much larger than this one in which We presently serve. We were a PLANET in that System and We were number four, just as the Earth is number four in relation to the Sun today. "Our Galaxy was headed by a Great Central Sun made up of two mighty Beings Whose Names have long gone out of the language of your Earth, but They came close to the sound of Elohae and Eloha, which implies the Masculine and Feminine aspects of the Elohim. "The System to which the Earth belongs (your System) came from the Central Sun of Alpha and Omega and has forty-nine Planets with Seven Suns (56)- one hundred less than the System of Elohae and Eloha. Let Me repeat: There is the Central Sun, from which Helios and I came, and beneath it twelve Suns. The fourth Sun down was the Sun to which We belonged and was Alpha and Omega. That sun, in turn, sent out twelve Planets in a horizontal manner and Helios and Myself were the Fourth Planet out from the Sun. This was on the out-breath, (*) the Suns descending and the Planets expanding - the out-breath of the Godhead so far as the creation of this System was concerned. "On the in-breath, which is the point you are coming to NOW in your System, the Suns began ascending, number twelve entering into the orbit of eleven, number eleven going in to the orbit of number ten and so on, all the Planets of that System also ascending one. "We represented the fourth Planet, in the fourth Solar System, and Alpha and Omega were Our Sun at that time! Alpha and Omega were the fourth Sun in that System, just as Helios and I are the fourth Sun in Our Present System. At that time, all the Suns in Our present System were all Planets. "Alpha and Omega were Our Sun; the first Planet out from Them was Osiris and Isis; the second one Apollo and Diana; the third Planet out was Krishna and Sophia; the fourth Planet was OURSELVES! The first movement on the in-breath drew Osiris and Isis into the heart of Alpha and Omega and each Planet moved in closer to the Sun one place, We moving into the third place in that System. In the next motion, We moved into the Second place, then the First place, and finally We were assimilated into the Presence of Alpha and Omega Who, in turn, went back into the Great Presence of Their Central Sun, Elohae and Eloha! "What exactly happens to the suns when They are absorbed into a Great Central Sun? That has bothered you somewhat. Around a Sun, or Central Sun, is a Causal Body, something like that illustrated in the picture of the Holy Trinity. Around the Central Sun (or the lesser Sun) are what we call Electronic Belts and these are made up of the number of bands that represent the planetary scheme. 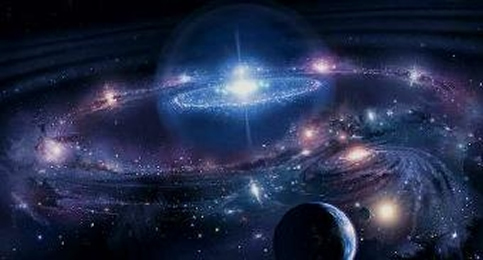 All of the Planets which belonged to that Galaxy, including Helios and Myself, have the Causal Body with the Twelve Bands around it, since that is representative of the System to which We belonged. We returned to the heart of Alpha and Omega, and Alpha and Omega ascended upward into the third, the Second and the First position beneath that Central Sun and then entered into the heart of Elohae and Eloha, the Central Sun of our Galaxy. "We did not dissolve! That is the thing that the student body becomes frightened about - becoming nothing, through the process of absorption. But that is no more true than you, as individuals, can become nothing through being absorbed into your own God Presence when you become Ascended! In this great Causal Body a Sun, whether it is a Sun of Our System or Alpha and Omega, is of tremendous size. In it there are glorious Temples of Light and when the Sun Gods return with their Own Electronic Belt--that is all the Planets and Intelligences and Beings within Them--they just enter into a sphere set aside in the Electronic Belt around that Sun and remain as intelligent, conscious Beings; even as there are coming into Our Aura the Beings and all the Intelligences of Mercury! They will live within the Mercurian Temples within Our Aura. "When We went back into the heart of the Central Sun of Our System with Alpha and Omega, into the heart of Elohae and Eloha, We had a choice! We could have stayed there and gone into the Cosmic Heights, or We could have remained in the joy of that magnificent Electronic Belt. Alpha and Omega and six other Suns (seven out of the twelve) applied to create a New Galaxy. That is why the Galaxy to which you belong and which We are presently serving as your Sun, is smaller since five of those Suns of the previous System, with their Planets, decided NOT to experiment with becoming Great Central Suns and creating a Universe in Themselves. "Alpha and Omega were among the Seven Suns Who chose to become Central Suns and the Seven now serving under Them as Suns were Their Planets when Alpha and Omega were just a Sun in Their previous System! So beneath the Central Sun of Alpha and Omega is the First Sun of Osiris and Isis; the Second sun Apollo and Diana; the Third Sun Krishna and Sophia, and the Fourth Sun Helios and Myself. Then the other three Suns below us. "This may seem difficult to understand but everything in this Universe is a succession of experiences. First you are a Planetary Lord, then you have an opportunity to become a Lord of a Sun! When this course is completed, Alpha and Omega presently breathing in, Osiris and Isis, will be the first Sun to return home into the Heart of Alpha and Omega. When all seven of the Suns have returned into Their Hearts, We will then determine what size the next Galaxy will be; that is whether Helios and Myself decide to try and be a Central Sun, or whether We stay within the Heart of Alpha and Omega and work from there. "Our original Galaxy which had one hundred fifty-six Planets and Suns is a minute Galaxy! There are some that have thousands and thousands, and you would need your late Professor Einstein to explain that! "Once more let Me repeat: Alpha and Omega, as one of the twelve Suns in that Galaxy, qualified to become a Central Sun. In like manner, the other six Suns, qualified to be Central Suns, in this Cosmic Galaxy, and not twelve. The Suns that now run down in Our present System were in a Horizontal position out from Alpha and Omega when They were a Sun. Beneath Helios and Myself, you have a very strong Sun - Hercules and Amazon. Then you have a more delicate one, Aureole and Aurea; and the last one is Dawn and Luz. This one will be the last to return into the Heart of Alpha and Omega when we have Our Cosmic Council and decide whether We, in turn, with the Planets of our System which to create a new System. "Above Us are Krishna and Sophia, with Seven Planets out from Them; the first Planet out being Illumina, the Second Mazda, the Third is known as Bella and the Fourth is Venus. "In Our System, there is Helios and Myself as the Sun and the First Planet out is Mercury, the Second Aquaria, the Third one is Uranus, below Bella, and the Fourth is the Earth, right below Venus. "On the in-breath, the first Cosmic motion is horizontal to the left, so that the Earth will move to the orbit of Uranus; Uranus will move into the orbit of Aquaria; Aquaria will move into the orbit of Mercury, and Mercury will be absorbed by Ourselves! "In like manner in the System above Us, Venus will move sideways into the orbit of Bella, then onward to the Planets you see in the chart, (*) and into the Heart of Their Sun, Krishna and Sophia. Venus and the Earth will still be together, Venus above the Earth as now, because They both will move in one space. "I thank you for as much comprehension, beloved ones, as you have. I want you to have this so you will understand that We are not talking as alarmists, nor are the Great Ones when They ask you for assistance in the changing of the vibratory action of your worlds. . . . "
"There are two main activities of life - the in-breath and the out-breath. In the two activities of breathing you have the magnetization of the Gifts and Powers of the Presence through the in-breath, and the radiation of Its Love, Wisdom and Power through the out-breath. This is the same activity that takes place at Cosmic Levels with regard to Suns, Planets, Systems and Galaxies - all operate on the rhythmic motion of the in-breath and the out-breath. "At the beginning of a "Cosmic Day," before a new Universe comes into being, the Central Sun in charge of the System breathe out the lesser Suns that are to assist It in the evolution of Its System. This it does in a perpendicular motion something like dinner plates piled one on top of another, only, of course, in this Cosmic picture there is a tremendous distance between the Suns mentioned. . . Nor, these lesser Suns, in turn breathe out the Planets which will make up the Galaxy, in a horizontal motion. At the end of the cosmic Day, the Great Central Sun notifies the lesser Suns that it is time for the in-breathing of their Planets, in preparation for the time when It (the Great Central Sun) will again absorb the entire system back into Itself, after the lesser Suns with Their Planets have evolved into the full perfection of Itself. . .
Those with the names of qualities are English derivatives of Sanskrit, Pali, Latin, Greek and ancient 'forgotten languages'. First movement is horizontal (left). Second movement is vertical (up).